The recipients of the 2018 Quarter Century Award are Nancy and Charles Donahue! Together, Nancy and Charles have made outstanding contributions to our community for more than 25 years. Charles has been very involved in the Westwood School System as well as our Recreation and Athletics organizations. He has served on the Westwood School Committee (Chairman), Westwood High Boosters (Founding President), Westwood Youth Hockey (President and Coach), the Westwood High Girls and Boys Hockey Associations (President) and the Open Spaces and Recreation Committee. In addition, he is on the Boards of the Irish American Partnership and the Francis Ouimet Scholarship. Nancy is a past President of the Westwood Historical Society and a Chairman on the Westwood Historical Commission. She has also served on the Westwood Educational Foundation (President), Walpole/Westwood League of Women Voters (President), the Westwood Cultural Council and the Westwood High Scholarship Committee. 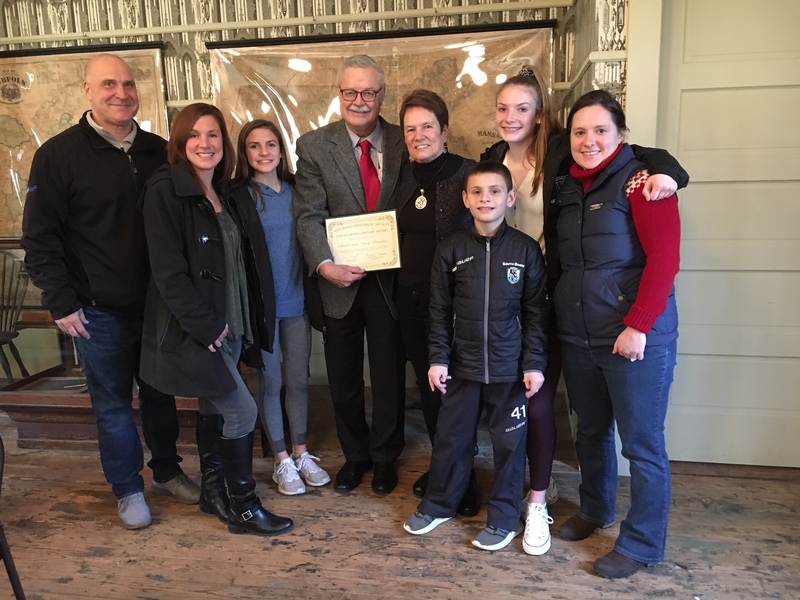 As a long-term member of the Westwood Historical Society, Charles has been a lecturer for several of our programs and is the current chairman of the Historical Society’s School Program at the Fisher School. He organizes the many volunteers who teach Westwood’s third graders each year in the 19th century style. Click on the links for two photos from the event. Background. 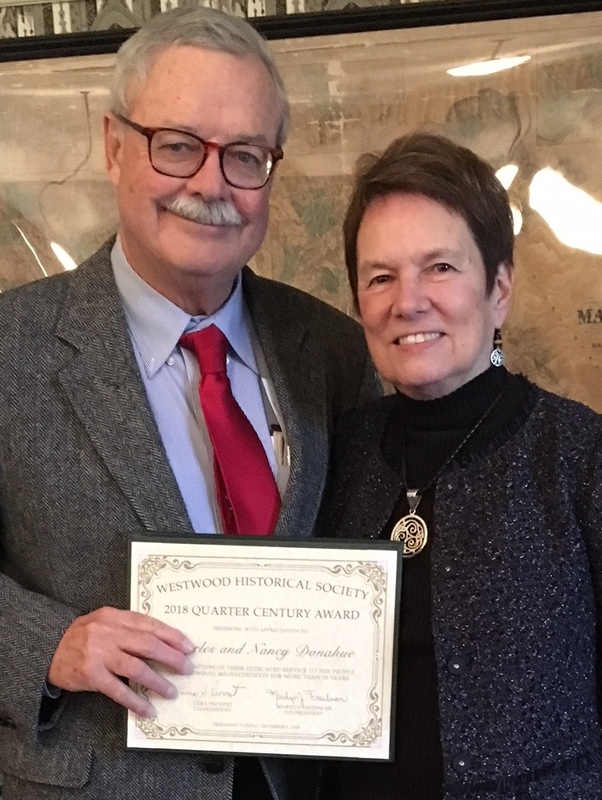 The Historical Society’s award is presented each year to a person or couple who have made an outstanding contribution to the community for more than 25 years, making Westwood a better place to live. The contribution could be in any field such as education, religion, arts, civic, or social service. Previous recipients of the honorary tribute are (chronologically beginning in 1990): Yetta and Alexander Fisher, Barbara and Allan Beale, Donald MacLellan, Allen Baker, Richard Youlden, Ellie and Roy London, Lillian Perkins, Robert Wood, Gordon Youlden, Tom Dunn, Joseph Weider, Emlen and Jim Wheeler, Duncan and Ellen McFarland, Shirley Howard, Joe & Joy Clancy and Irene and Ralph Buonopane, Barbara Friedman, Mike Beaumont, Joan Swann, Lura Provost, Russ and Marilyn Downs, Ann and Jerry Cronin, Joan Murphy, Sam and Barbara Hayes, and Tony Antonellis. Nominations. Nominations are due each May 31st. If you would like to nominate someone or a couple, please write a brief letter outlining how the nominee has contributed to the Westwood community and mail it to the Westwood Historical Society, 830 High Street, P.O. Box 2575, Westwood MA 02090.